From the historical landing beaches in Normandy to the vibrant city of Amsterdam, Cosmos offers you affordable tours throughout France and Holland. 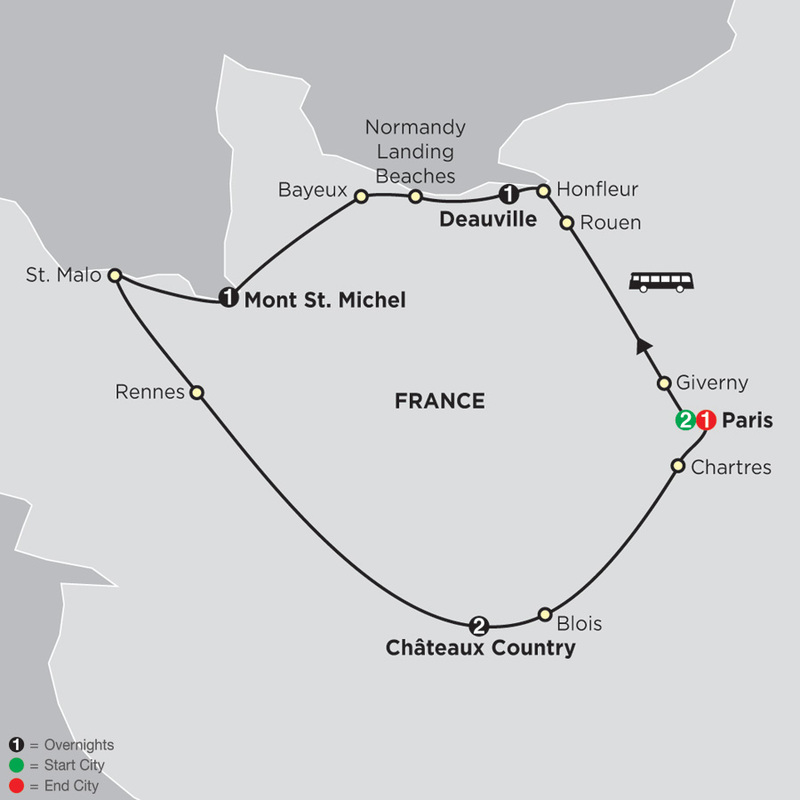 On your escorted tour, you'll relax in the French Riviera, enjoy France's Burgundy region, or delight in Holland's scenic landscapes, historic monuments, and lively cities. Without compromising your budget, you’ll taste the mouth-watering cuisine in France and savor the cultural experiences offered throughout Holland. 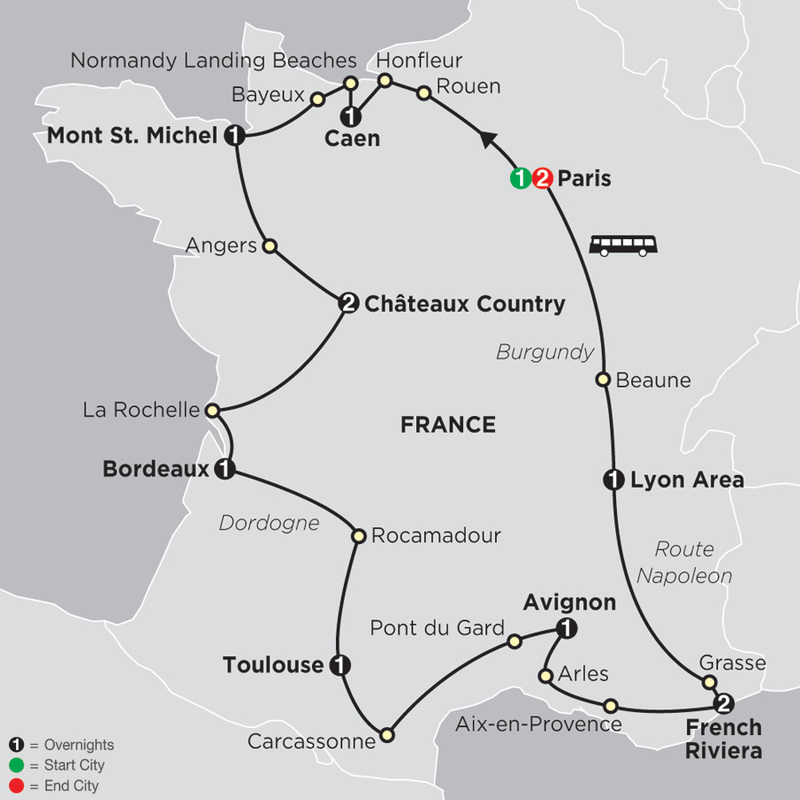 Explore France and Holland tour packages below. Famous for its tulips, windmills, and wooden clogs, Holland is a delightful country with scenic landscapes, historic monuments, and vibrant cities. You’ll get to know the country on this affordable tour of the Netherlands starting and ending in Amsterdam. Amsterdam, Holland’s ...Read More. This northern France tour is the perfect way for value-minded travelers to see the highlights of Paris plus the Loire Valley and Normandy. Beautiful scenery combined with famous landmarks and fascinating history sum up this tour.You’ll visit some of northern France’s interesting ...Read More. 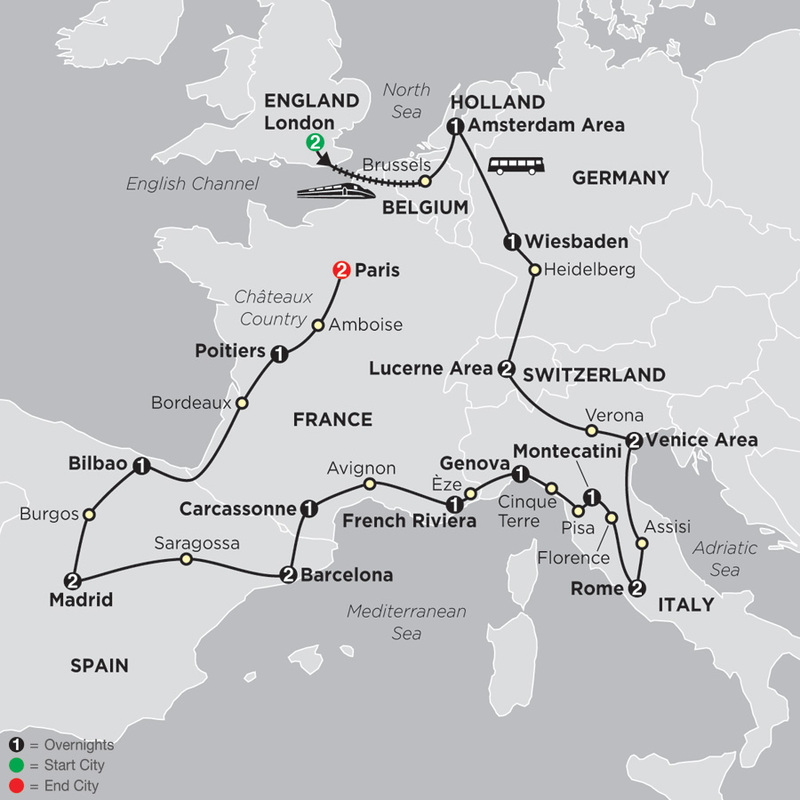 If you want to see Western Europe’s main highlights but don’t have a lot of time, this European tour is the vacation for you! 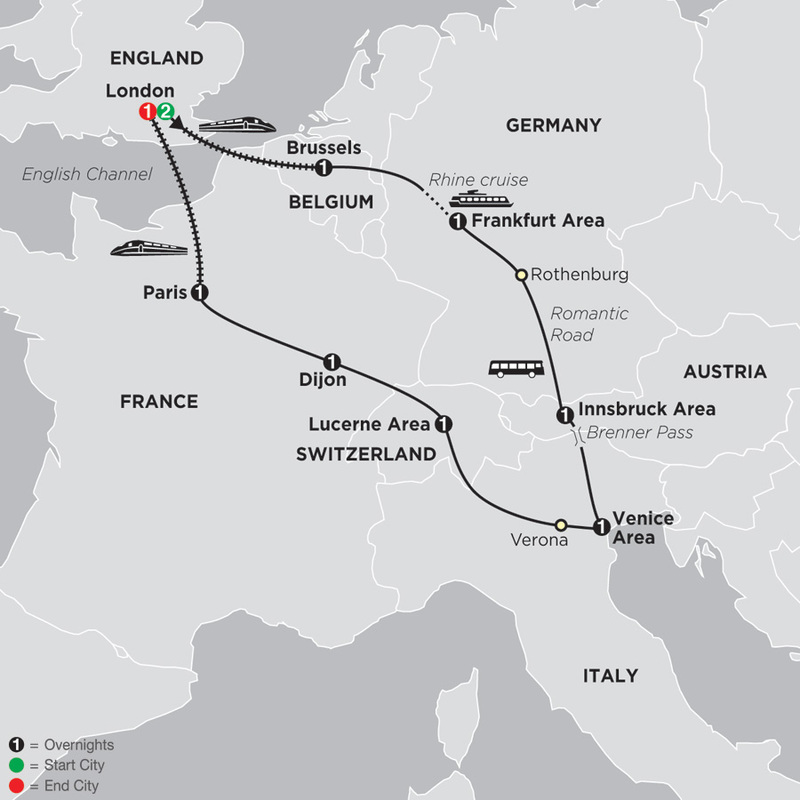 Visit England, Belgium, Germany, Austria, Italy, Switzerland, and France with overnights in London, Brussels, the Frankfurt area, the Innsbruck area, the ...Read More. 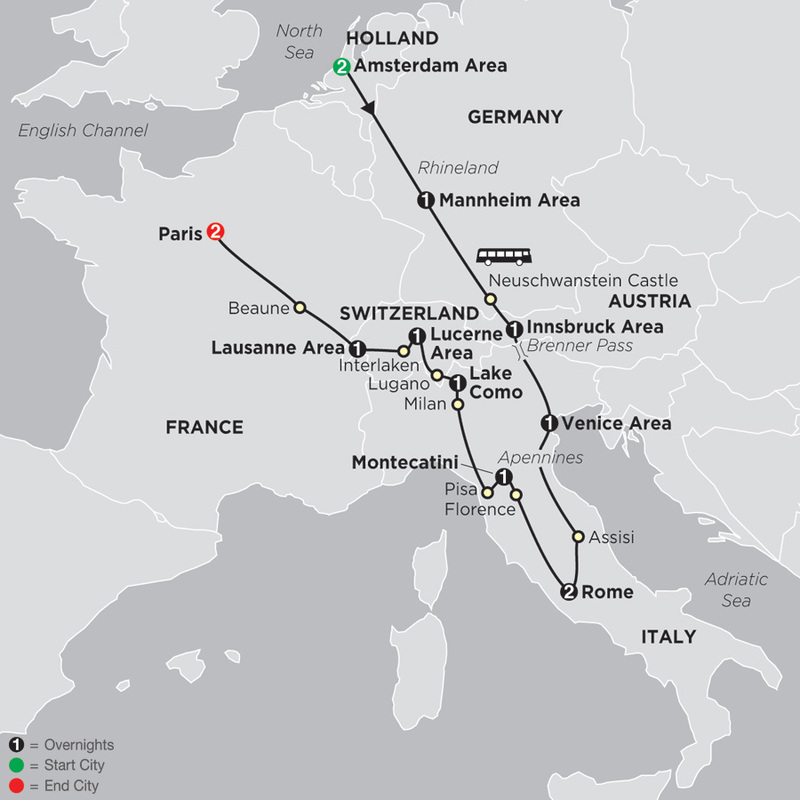 As the name implies, this European tour features some of Europe’s capital cities. You’ll stay 2 nights in Paris, capital of France; Brussels, capital of Belgium; you’ll visit Amsterdam, capital of the Netherlands; Berlin, capital of Germany; Prague, capital of the Czech ...Read More. 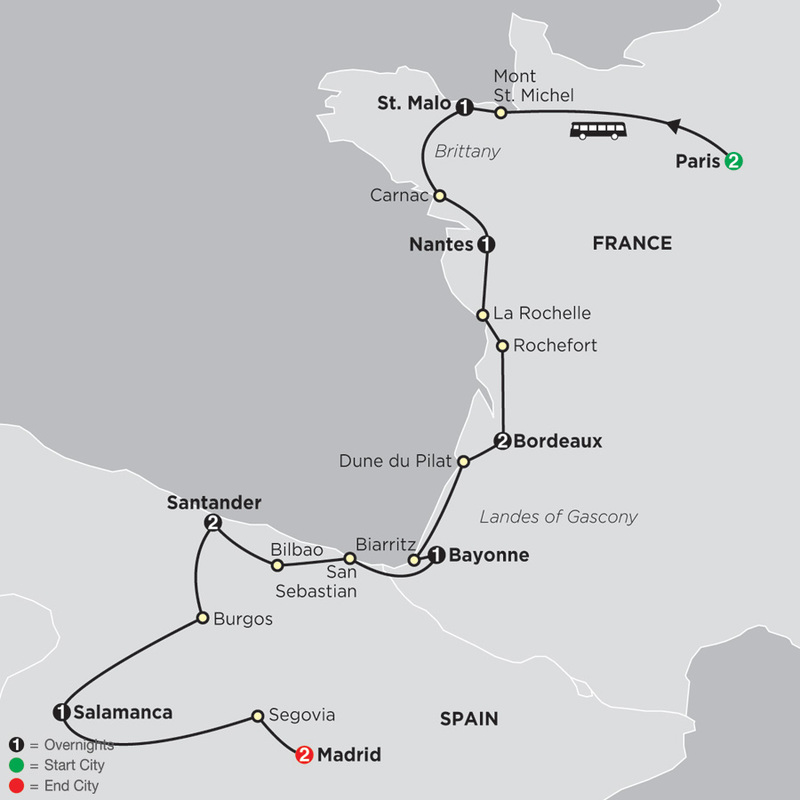 Discover the main attractions as well as the hidden gems of two colorful countries—France and Spain—on this exciting vacation stretching from Paris to Madrid. Among the less known tour highlights is Carnac, with its megaliths—standing stones—dating back to 4500 to 2000 BC - and ...Read More. From Spain to France to Italy, this affordable tour along the Mediterranean Coast, features vibrant cities, historic sites, and stunning scenery. 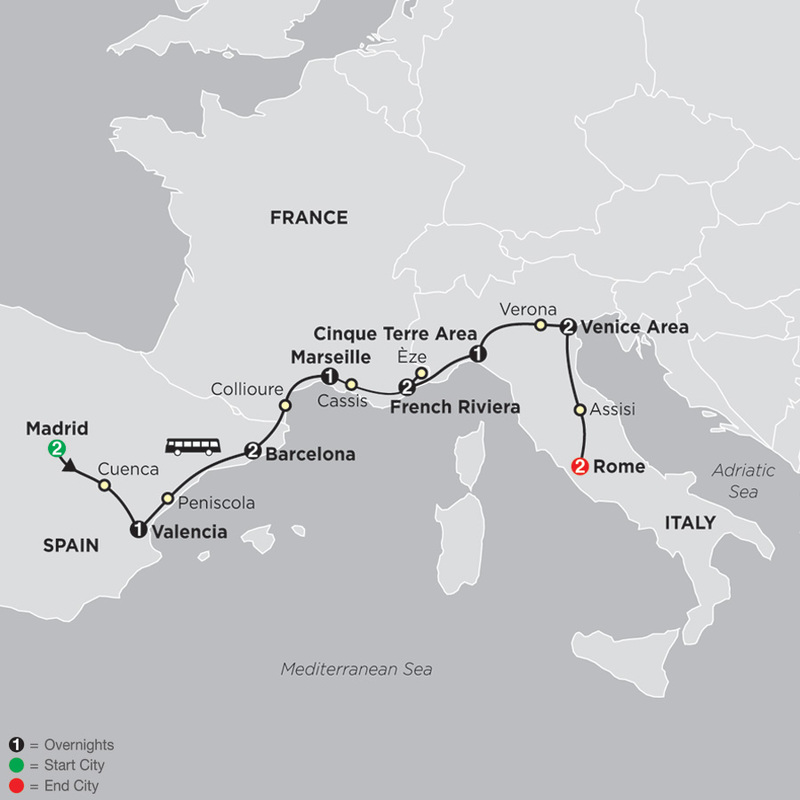 You’ll stay in Madrid, Valencia, Barcelona, Marseille, the Venice area, and Rome. You'll also overnight in the French Riviera and the ...Read More. 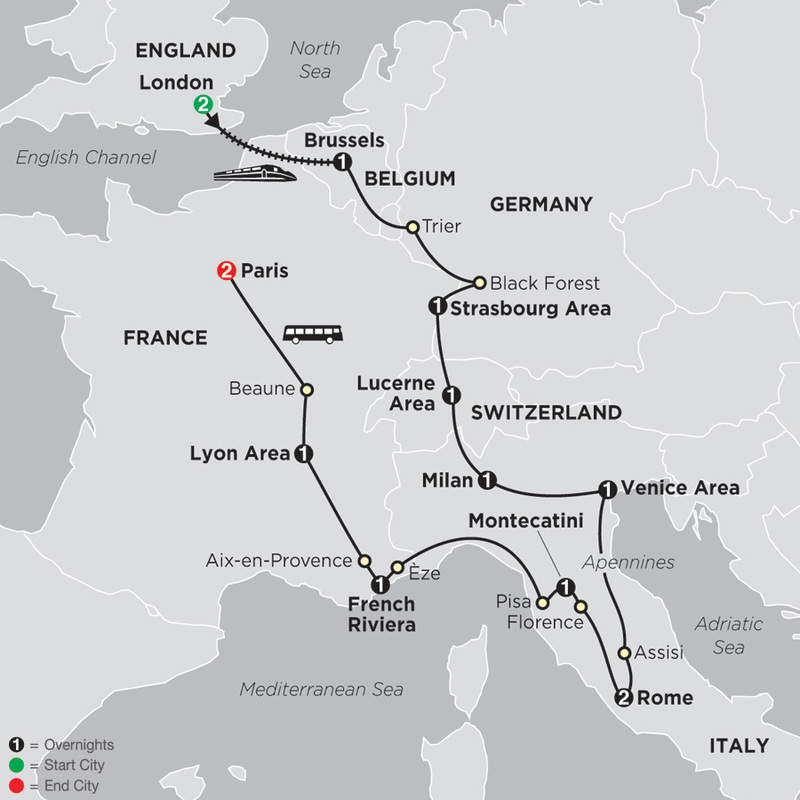 From its exciting cities to its spectacular scenery, Europe has it all, and on this affordable European tour, you'll see the main highlights. Start in Amsterdam with a scenic canal cruise and end in Paris with a guided tour and time on your own. In between, you’ll discover ...Read More. 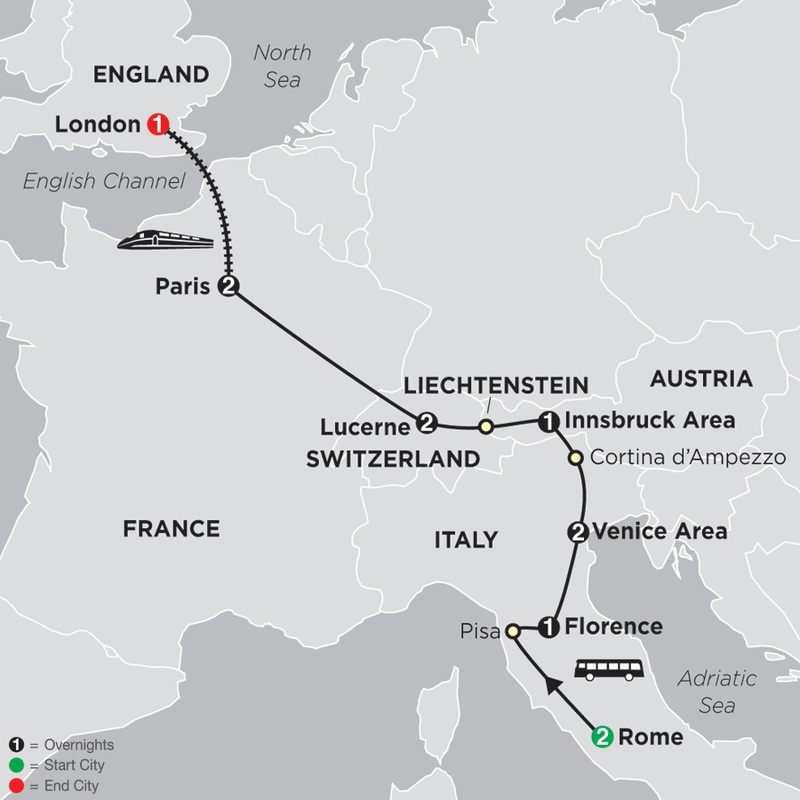 From Rome to London, travel to Western Europe’s most famous cities on this European tour. 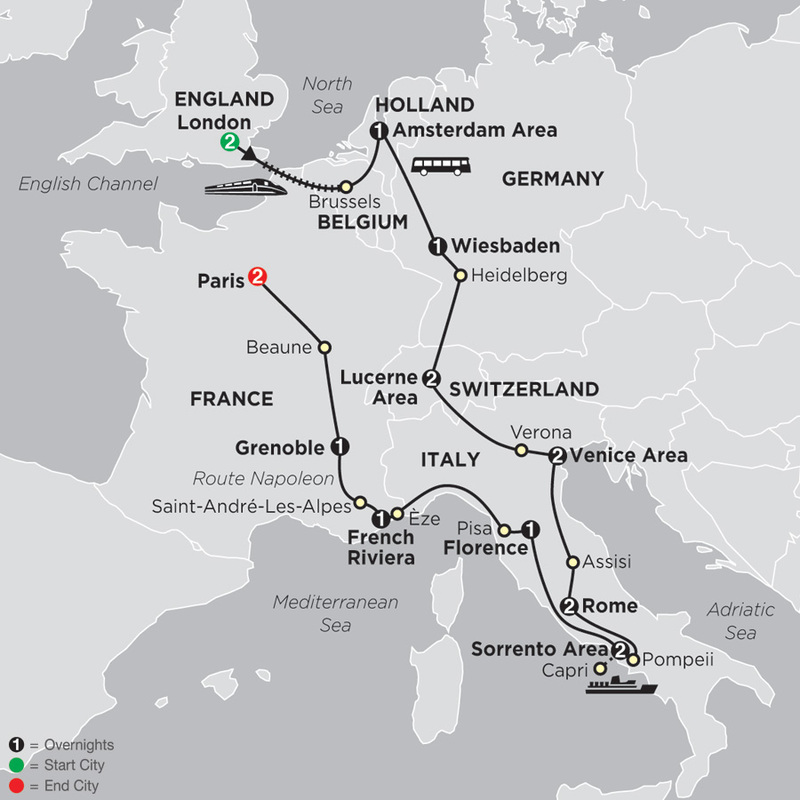 Along the way, see some of Europe’s most iconic sights and witness beautiful scenery. In Rome, Florence, and Paris, see the must-see sights on your guided sightseeing. In Rome, take a walk ...Read More. You’ve seen photos of the Eiffel Tower—now’s your time to see it in person. 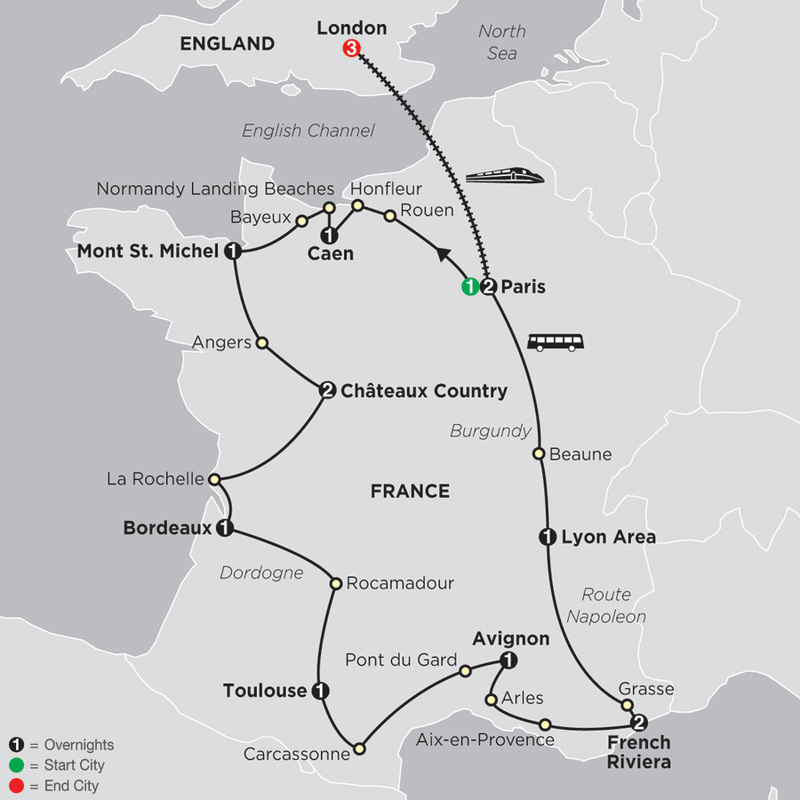 You’ve studied and read about D-Day’s Normandy Beaches—now’s your chance to visit them. You’ve heard about France’s famous wines—now’s your chance to see the wine-growing region in Bordeaux. All of this ...Read More. 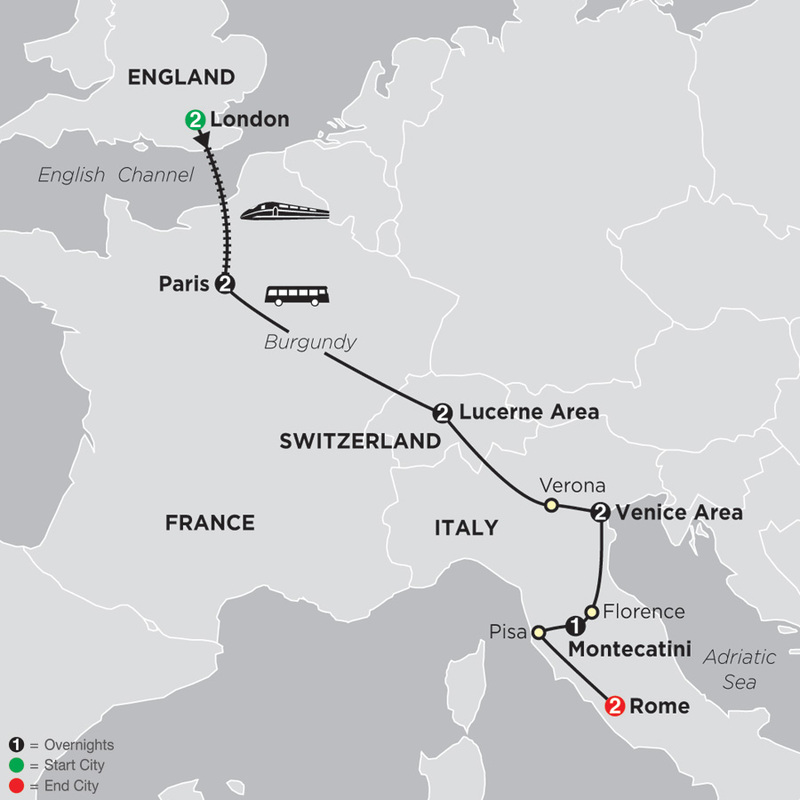 From London to Rome, travel to Western Europe’s most famous cities on this affordable European tour. Along the way, visit celebrated cities as well as picturesque towns and witness beautiful scenery. After visiting the British capital, you’ll experience an engineering marvel, ...Read More. 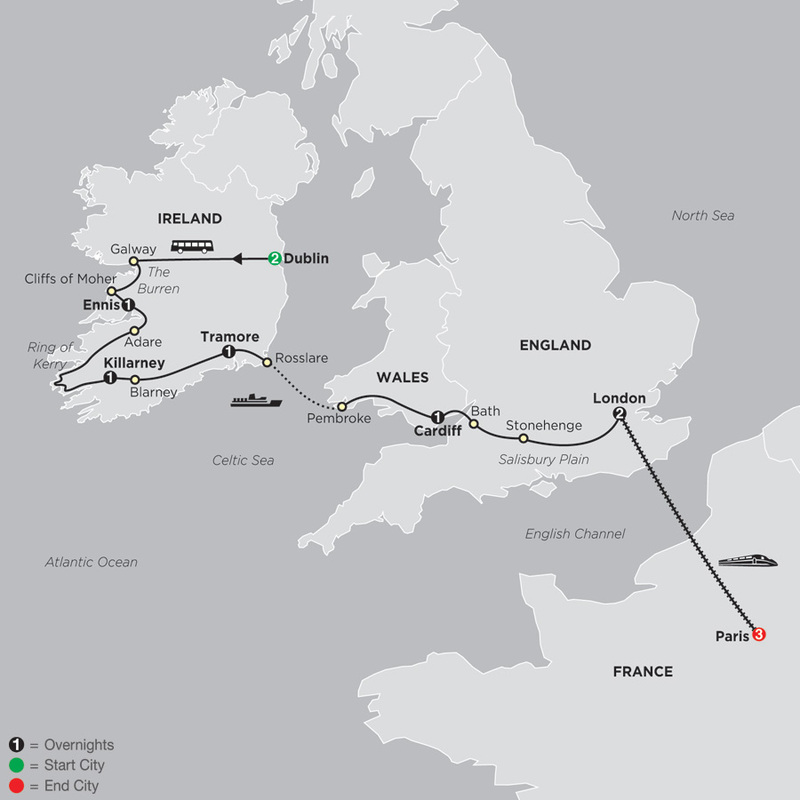 Stunning scenery, pretty villages, ancient sights, and exciting cities—this budget-minded tour of Britain and Ireland (with Paris) offers all of this and more. Your tour starts in Dublin, Ireland’s fun capital; ends in Paris, France’s exciting capital; and overnights along the ...Read More. 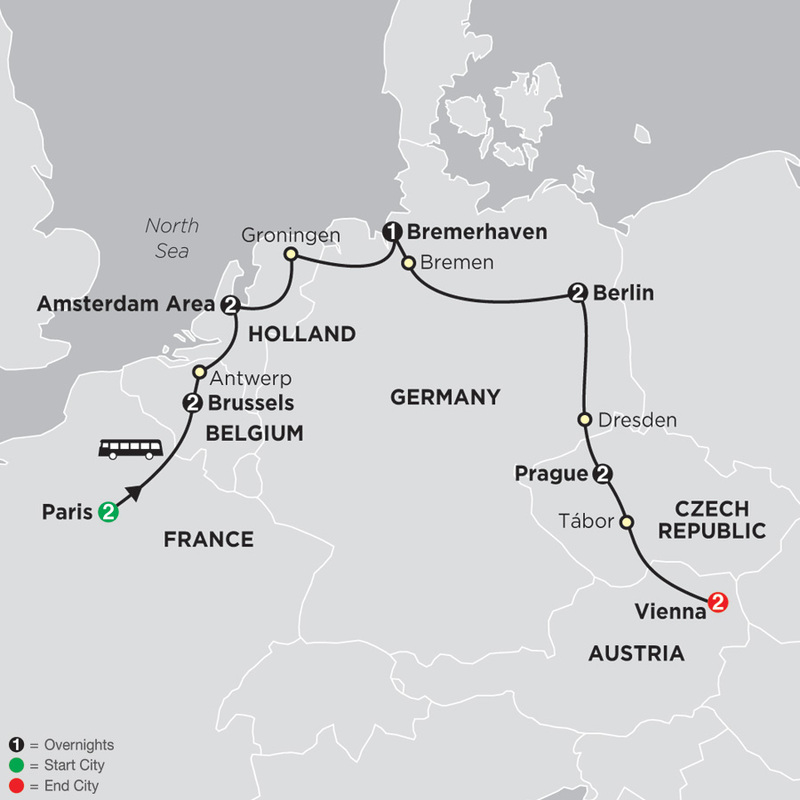 Europe—it’s a continent full of different cultures, architecture, art, scenery, and histories—and on this European tour, you’ll get to experience and see what many of the European countries have to offer. You’ll start in London, then take a comfortable ride on the Eurostar train ...Read More. 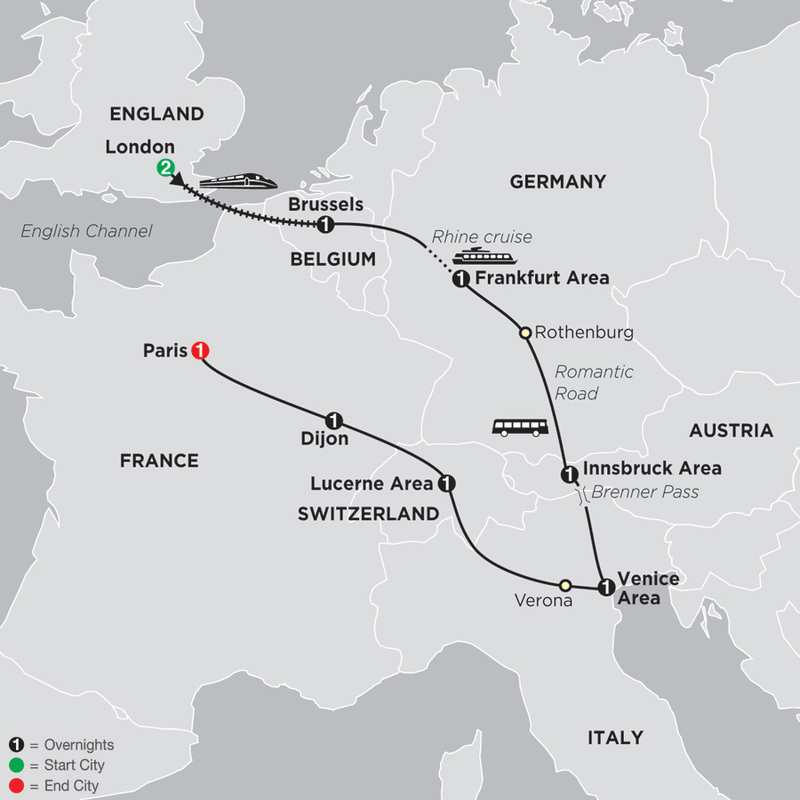 From London to Paris via Belgium, Germany, Switzerland, and Italy, discover the many wonders on this memorable European tour. History buffs will delight in seeing many of Europe’s historic sights. In Rome, see the iconic Colosseum, completed in the 1st century AD. In Lucerne, ...Read More. 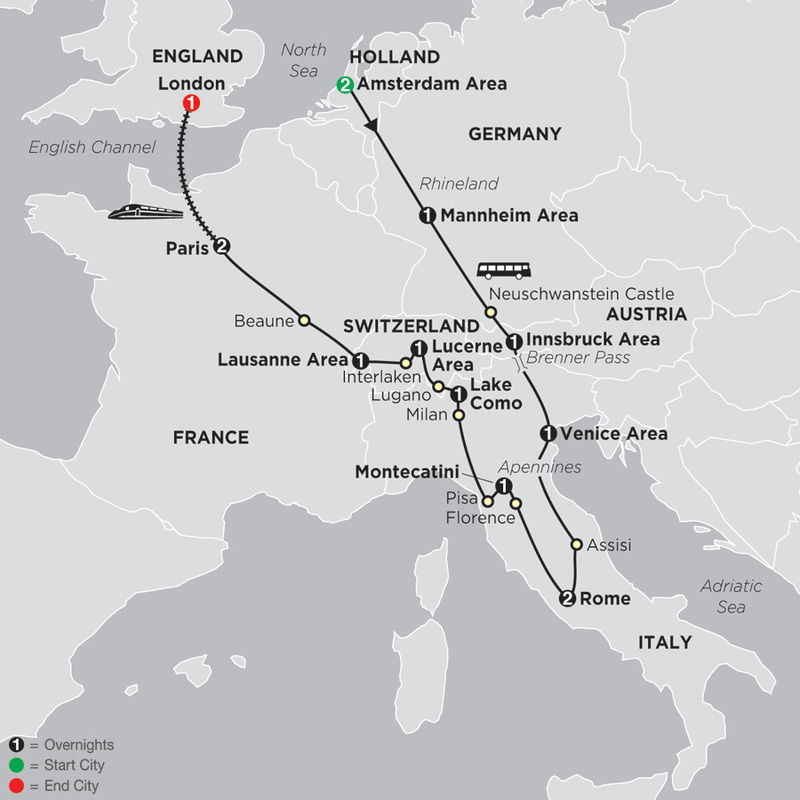 Your 17-day affordable European tour features some of the most dynamic and historic capitals on the continent. 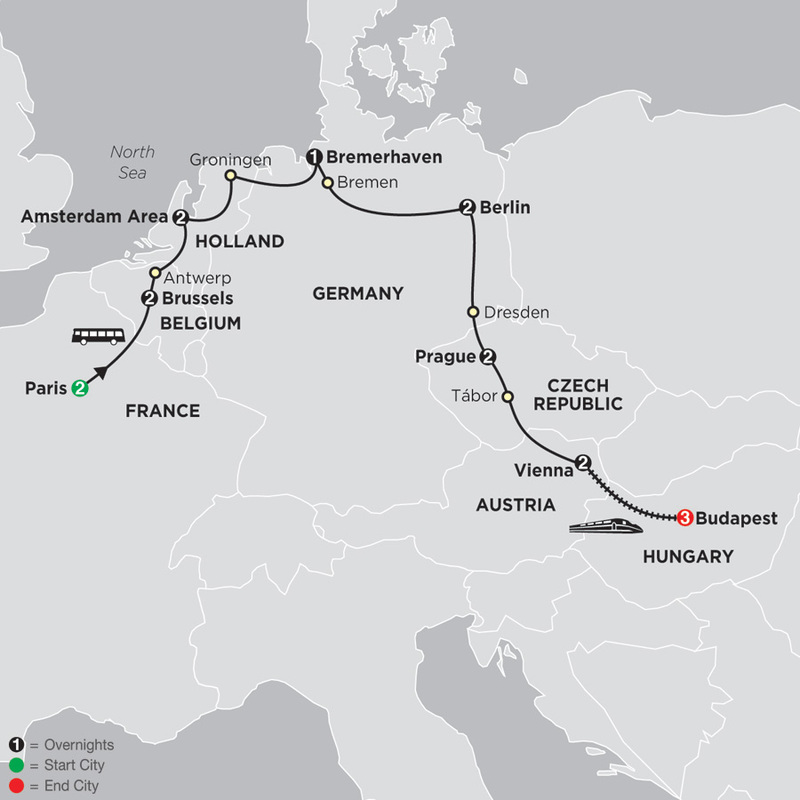 From Paris to Vienna, and major points in between, you’ll become familiar with legendary cities such as Brussels, Amsterdam, Berlin, Prague, and Budapest. You’ll ...Read More. 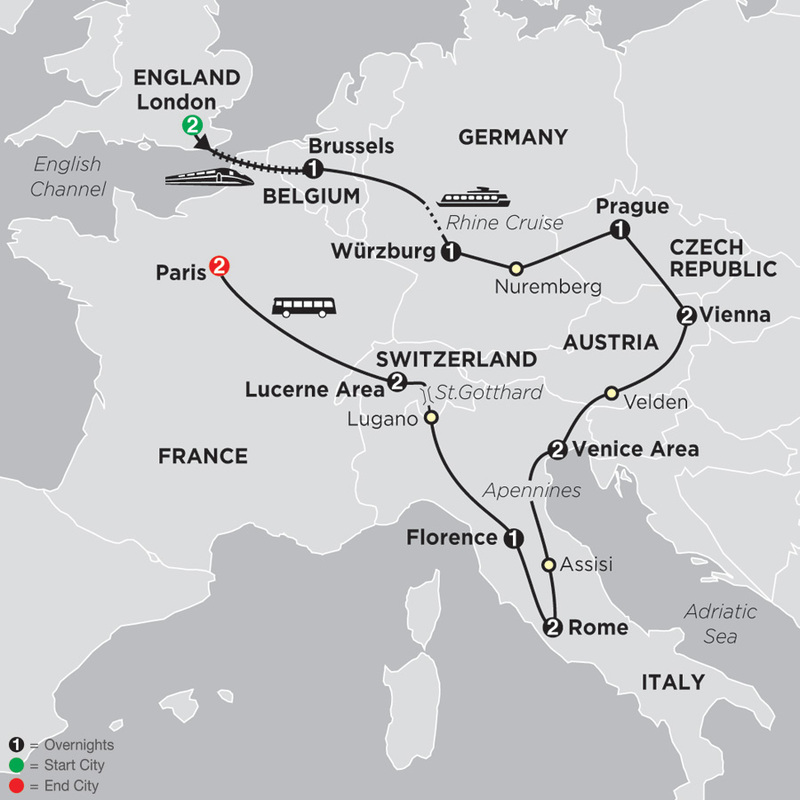 A European tour… should include the most popular and exciting cities, the must-see sights, picturesque scenery, and a mix of culture, history, and just plain fun. 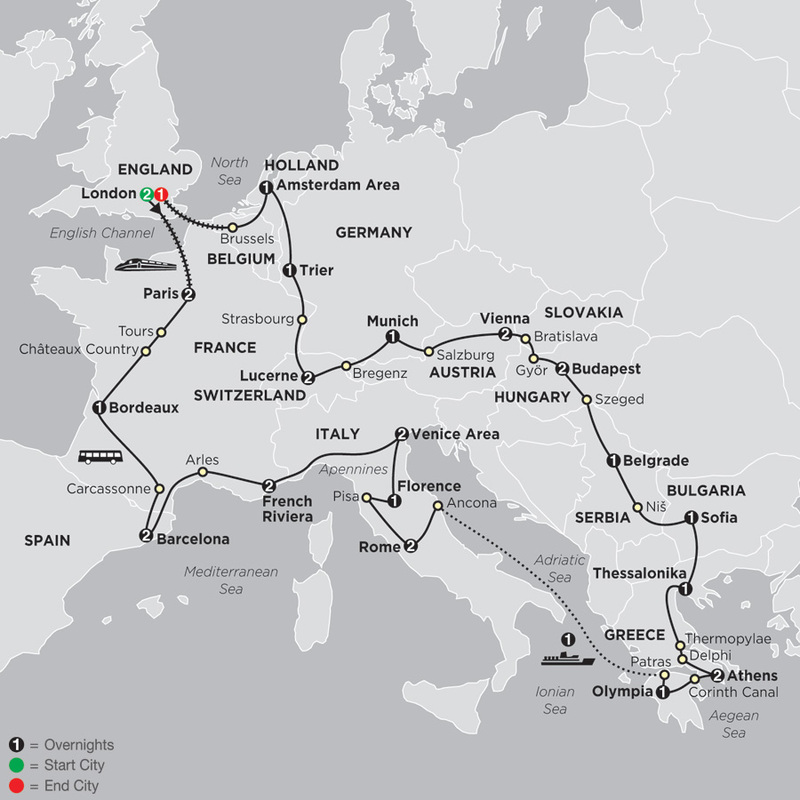 On this Best of Europe tour, you’ll experience all of this and more. You will start with visiting London, the ...Read More. Experience some of Britain’s fascinating towns as you travel through England, Scotland, and Wales, stopping for overnights in London, Leeds, Edinburgh, Strathpeffer, Glasgow, Liverpool, Cardiff, and Plymouth. Part of the charm of traveling through Britain is seeing the ...Read More. 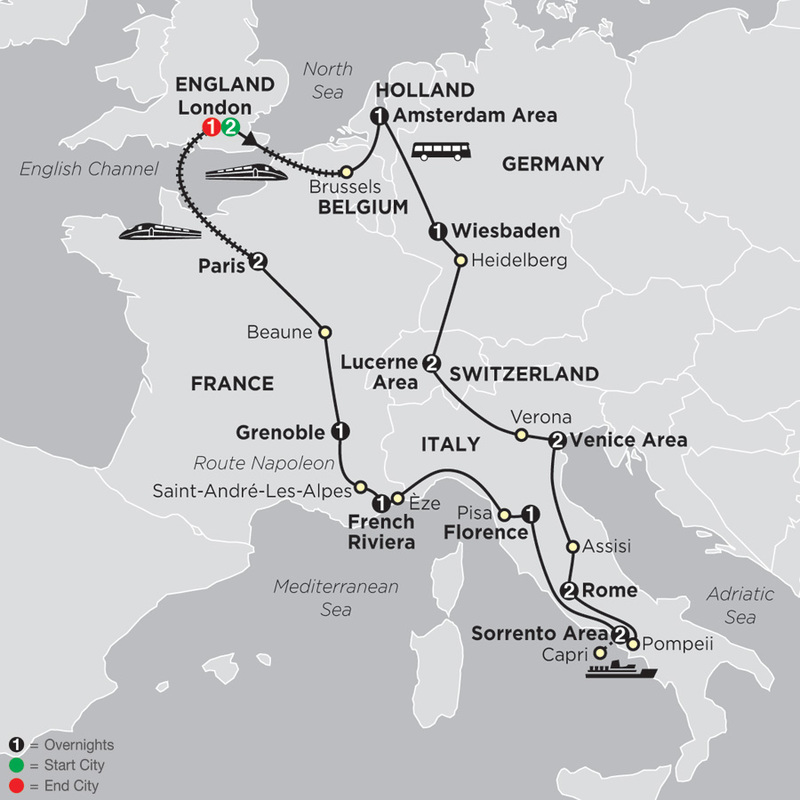 This extensive European tour stretches through Central Europe from London to Rome, then along the Mediterranean coast to Spain and France. You’ll travel to some of Europe's most famous cities—London, Amsterdam, Lucerne, Venice, Rome, Florence, Barcelona, Madrid, and Paris—and ...Read More. 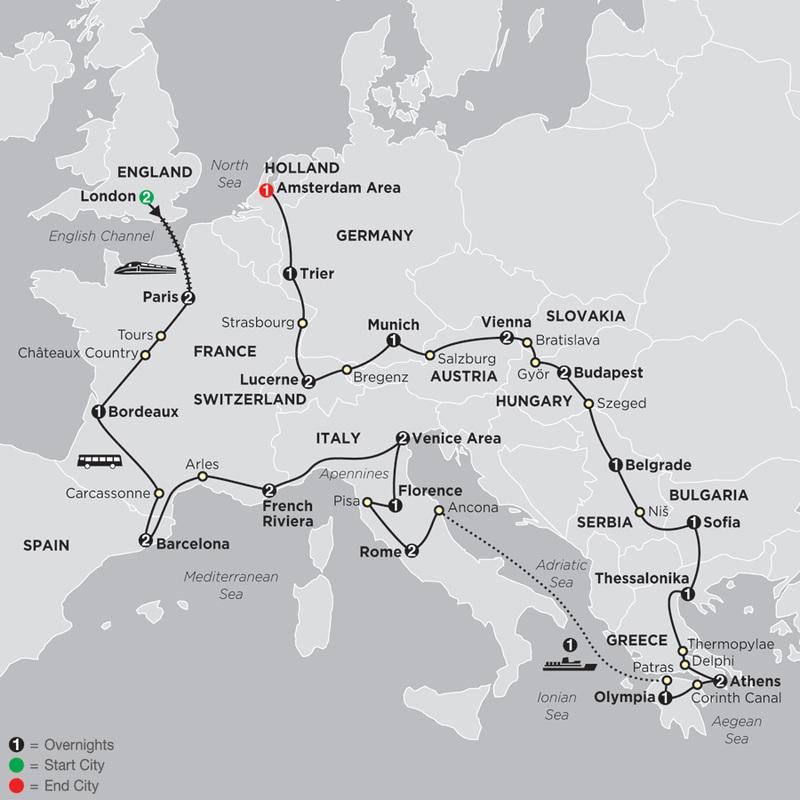 What do you want from your European tour—historic treasures, amazing architecture, scenic beauty, and exciting cities? Whatever it is, this European vacation offers it to you! You’ve heard about a tiny but powerful state with a treasure cove of masterpieces, Vatican City – now ...Read More.